We are committed to an Aquarium that is open, accessible, and inclusive to everyone, including those with visual, hearing, physical, or sensory-processing needs. We strive to provide an engaging and interactive experience for everyone, regardless of their ability. The Aquarium has partnered with KultureCity to help people with special sensory-processing needs enjoy their visit. Special kits are available at the Information Desk and our frontline staff has received training designed to raise their awareness of sensory processing needs. Special early-access mornings for people with sensory processing needs and their families have also been scheduled periodically throughout the year. Visitors with hearing impairments can benefit from description panels throughout the New England Aquarium. These panels include exhibit descriptions, species identification, discussions of conservation issues, and much more. Many of the descriptive panels include photographs or diagrams as well as text. Many Aquarium exhibits incorporate elements that are helpful to visitors with visual impairments, such as oversized typefaces, bold illustrations, and colorful graphics. Many of the descriptive panels include photographs or diagrams as well as text. The Aquarium welcomes American with Disabilities Act (ADA) defined service dogs that are working animals trained to perform tasks for the benefit of individuals with physical or mental disabilities–such as guiding people who are blind, alerting people who are deaf, alerting and protecting people prone to seizures, or other tasks directly related to a disability. These dogs must be always under control due to the nature of the facility and the animals under our care. Dogs whose sole function is to provide comfort or emotional support do not qualify as service animals under the American with Disabilities Act. Only ADA-defined service dogs are permitted to enter the Aquarium. On June 2, September 8, and December 8, the Aquarium will open at 8 a.m. exclusively for people with special sensory processing needs and their families. These events allow for early access to the Aquarium and a quieter experience with all your favorite marine animals. Soft lighting, limited use of microphones, and other modifications will ensure a comfortable environment for all participants. The building opens to the public at 9 a.m., but building modifications will remain in place until 10 a.m.
Aquarium admission tickets are required and will be available to purchase online in advance. Attendance is limited to 300 people. Ticketing to future events will be posted here when they are available for purchase online. 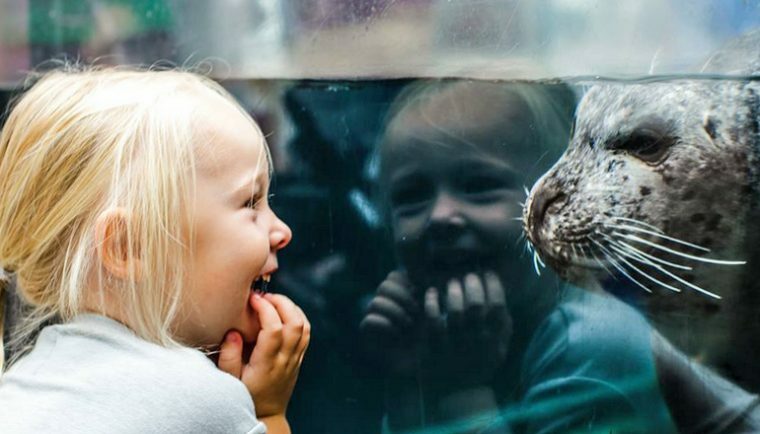 The New England Aquarium has partnered with KultureCity to help people with special sensory processing needs enjoy their visit. Kits, which include fidget tools, noise-canceling headphones, and other resources, may be checked out at the Information Desk by leaving a driver’s license or other form of identification. Guests may also use the first aid station for a few minutes of privacy, if needed. The Aquarium’s frontline staff has received training designed to raise their awareness of sensory processing needs to make the Aquarium a more welcoming place for all to visit. Visitors can also download the KultureCity All-Inclusive App to get a social story to further help with your visit. Visitor drop-off and pickup is allowed at the Aquarium’s main entrance. An elevator provides wheelchair access to the Aquarium station and platforms. An American Sign Language (ASL) interpreter is available from 12:30 p.m. to 4 p.m. on the *first Sunday of every month. 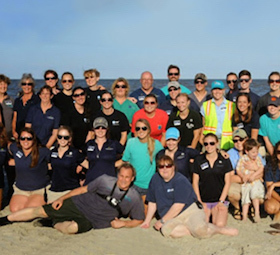 ASL interpreters can be arranged to enhance the Aquarium experience for visitors who are hearing impaired. Assistive listening devices are also available at the Information Desk and Simons IMAX Theatre Box Office. Groups of 15 or more can arrange a special guided tour by calling 617-973-5206. For reservations, please call 617-973-5206 at least two weeks in advance. Tours are based on availability. You can dial 711 on your telephone and be connected with a TRS operator. 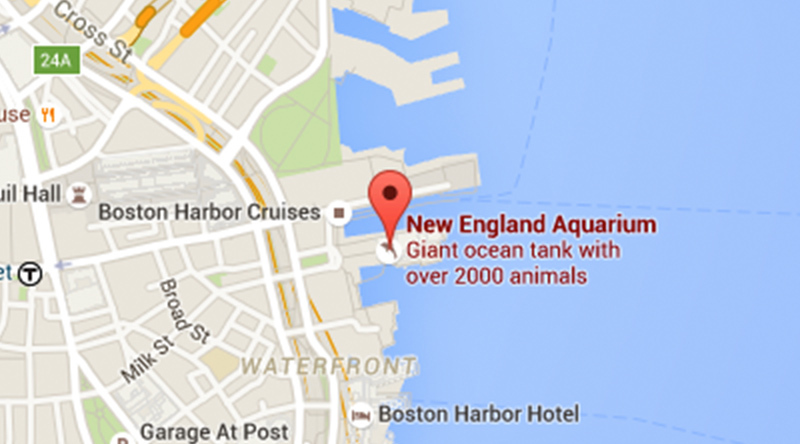 Once connected with an operator, provide the operator with the Aquarium phone number: 617-973-5206. This free service will connect you to the Aquarium where we will be able to answer any of your questions. At the Edge of the Sea exhibit on the third Level, visitors are encouraged to gently touch and examine sea stars, periwinkles, horseshoe crabs, and other animals in this exhibit. The Temperate Waters Gallery on the second level has a textured handrail to help visitors understand evolution, survival in harsh habitats, and the function of fish shape. At The Trust Family Foundation Shark and Ray Touch Tank on the first level, visitors can reach out and gently stroke cownose rays, bamboo sharks, and other species of animals as they swim gracefully through the water. 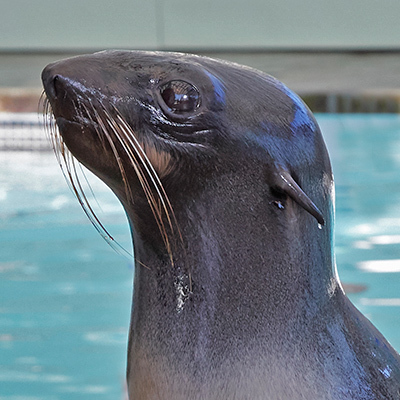 At the New Balance Foundation Marine Mammal Center, visitors can explore various animal artifacts such as seal flipper bones and skulls as well as various interactives. Closed captioning devices: Limited numbers of reflectors for captioning are available at the theater’s box office 15 minutes before showtime. Please ask the theater director or manager on duty. A form of ID must be provided to borrow equipment. For quicker service, make a request at the Aquarium box office when purchasing or picking up tickets or call 617-975-5206. Wheelchair-accessible seating is located at the top of the theater. There is space for up to six wheelchairs. Elevator access will bring you to the top of the theater. Available in the Aquarium lobby, the guide includes a map of the Aquarium. The Aquarium has three wheelchairs that guests may borrow for free. They are available on a first-come, first-served basis. To sign out a wheelchair, please speak to our staff at the Information Desk in the main lobby. A driver’s license is required in order to rent. Please contact a staff member at the Information Desk or the closest staff member to you in an emergency. For allergen information or questions regarding menu items in the Harborview Café, please contact our café managers at 617-590-2540. Two automated external defibrillators (AED) are located throughout the Aquarium and one in the Simons IMAX Theatre. First-responder personnel have been trained in their use. If you have special accessibility needs or questions, please call Central Reservations at 617-973-5206. 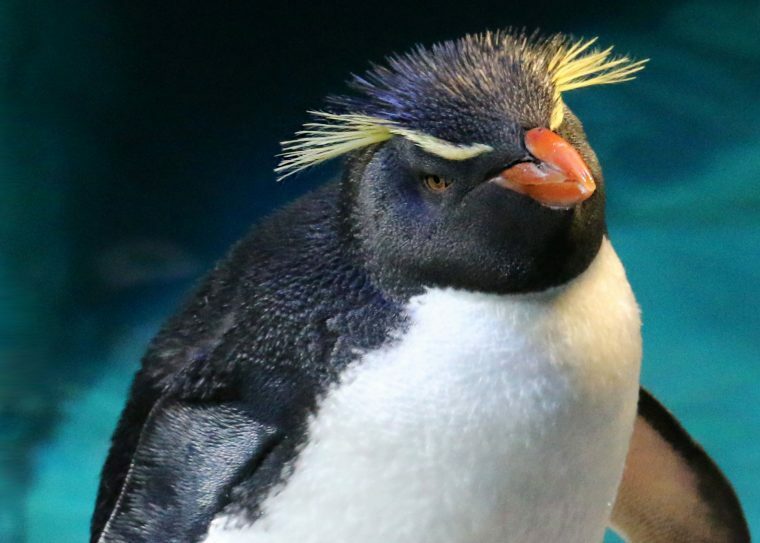 The Aquarium has affiliated with MagnusCards, a free app to help people with cognitive special needs learn life skills. The Aquarium card decks take a step-by-step approach to help people learn about visiting the Aquarium. Visit the MagnusCards site for more details about the free app. Visitors using wheelchairs are welcome at the Aquarium free of charge. Every part of the Aquarium is open to visitors with wheelchairs or strollers. Eight wheelchair spaces in the Simons IMAX® Theatre; unfortunately, strollers are not admitted to the theater, but are stored in a secure area while you enjoy the film.